Located in the popular Wat Bo area this European managed Hotel/Guesthouse offers attractive rooms with ensuite bathrooms, hot water and AC. Most importantly the western style beds provide a good night's sleep, essential after a long day's sightseeing or partying. 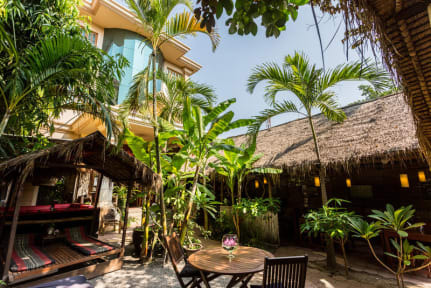 Outside there is a secluded garden where you can relax with a cold drink or dine from their extensive menu, all served from the bar by their friendly English speaking Khmer staff. I think you will agree, whether you are a solo traveller or a large group, Babel Siem Reap Guesthouse offers unbeatable value, accompanied by a broad smile. The staff were what made the place - they were so friendly and welcoming. The guesthouse was tastefully decorated and clean. We loved the environmentally friendly facilities such as free water refills etc. Fantastic place to stay with great ethics (refillable water station & toiletries, staff go on the day trips so they can experience them firsthand). Staff were all very knowledgable & helpful when booking trips. We did a village tour with one of the tuk tuk drivers which was definitely a highlight of our time in Siem Reap. Room was clean & quiet. Fruit, muesli & yoghurt breakfast was amazing! Beautiful hostel with an incredibly friendly and helpful staff. The work this hostel is doing to save the planet is remarkable. The food was delicious and our tuk driver was amazing. He took his time to share with us the history of the town, pointing out unique little spots along the city and in general was such a kind person. When he showed us the countryside, he ever got some tiny watermelons for us to try. Highly recommend their trip to the temples and the massage service! Amazing eco friendly hostel with very friendly and helpful staff as well as hassle free tour organisation. Would very highly recommend. Loved this place - a chill atmosphere with friendly staff, clean facilities, and a solid menu. Would come back again in a heartbeat! The staff at Babel were brilliant from the moment we arrived at about 5am on the day of our check-in: the night guard lent us 3 dollars for our tuk tuk and we were able to check in early at about 6am. The room was really nice and the whole guesthouse was very clean. They also sorted our bike rental for Angkor Wat so we were able to cycle straight from the hostel. The food at the bar / restaurant was good too. We would definitely recommend staying at Babel! Staff was welcoming and friendly, they showed us to our room even though we were 5 hours early for check in. Rooms were clean and spacious. Restaurant was delicious and was convenient for coffee, beer, breakfast, and snacks. The water refill station was much appreciated. Our tuk tuk driver was friendly and helpful throughout our stay along with guiding us on our all day visit to Angkor Wat and the surrounding temples. The pool down the street was a great, unexpected treat. Really great eco approach, especially the refill stations downstairs. Staff was extremely friendly and accommodating! Only issue was shower pressure sucked, water barely came out. Otherwise, great place for budget travelers with groups! This was a great hostel, and I would recommend it to anyone. We had a double room with ensuit, and it was big, with a nice clean bathroom, great aircon, and comfy bed. The staff were friendly, and the tuk tuk drivers are great! Everyone who works at the hostel really believes in the values of the hostel, and the staff are treated like family by the owners. It was really enjoyable to be in a genuinely nice place, with great people. Our tuk tuk driver was great too. Definitely recommend. Beautiful chill area. The free airport pickup is really nice. The owners are very involved in cultivating a positive atmosphere. The place is darn near perfect except for the rooms. We booked a private double and got a twin. We were told that they were doing renovations in the off season and that all of the doubles were being worked on. Fair enough, I’m sure they’ll turn out great. But we felt a bit duped. Plenty of other options in SR that come exactly as advertised.